This is the moment for an underappreciated writer. 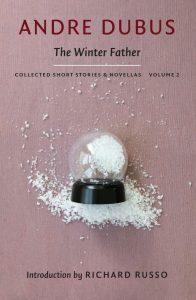 Joshua Bodwell discovered as a young man the extraordinary prose of Andre Dubus, and therein lies a short-story story. Twenty years ago, when he was just 23, Joshua Bodwell had an encounter that would change his life. WHAT: Ann Beattie, Richard Russo and Joshua Bodwell discuss and read from the three-volume relaunch of the short stories and novellas of Andre Dubus. WHAT: Andre Dubus III and Joshua Bodwell discuss both Dubus III’s new novel, “Gone So Long,” and the three-volume relaunch of the short stories and novellas of his father, Andre Dubus. With a book. Or, more precisely, with a writer. Two decades on, Bodwell still recalls his introduction – to Andre Dubus, the late, great short story writer – with impressive detail. It was February 1998, and Bodwell, today the executive director of the Maine Writers & Publishers Alliance, had stopped in at All’s Well Books, “the one in Wells with the unfortunate punning name,” he said. The book was “Dancing After Hours,” and just a few months later, “by a stroke of good luck,” Bodwell happened upon the rest of Dubus’s oeuvre at a used-book store, Harding’s Books, also in Wells. He bought the whole lot. He still remembers what he paid – $6 apiece. He also remembers exactly where he was and what he was doing (Thanksgiving Day, at the movies), admittedly just two years ago, when he got the idea to propose to Dubus’s former publisher, the Boston-based David R. Godine, that it bring out the collected works of Dubus. That’s the category where Bodwell places Dubus. But perhaps not for much longer. 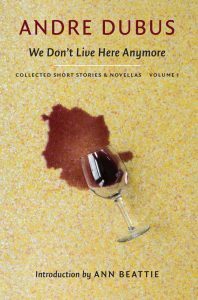 This June, the first two volumes of Dubus’s “Collected Short Stories & Novellas” – “We Don’t Live Here Anymore” and “The Winter Father” – were published. 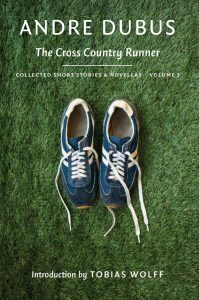 Volume three, “The Cross-Country Runner,” is due out in October. Bodwell is the series editor, Godine the publisher, and Bodwell recruited several other notable Mainers to contribute. Take “Townies,” a story ostensibly about a murdered college girl. Here’s how Dubus briefly describes the job path of one of his protagonists. Tobias Wolff will introduce the third volume. (Bodwell called Wolff, Beattie and Russo his “dream team. I got my wish list of writers like a Christmas present.”) An audio book – ’80s sitcom actor Bronson Pinchot is one of several readers – is in the works for this fall, and Godine is trying to sell the U.K. rights. “I think they’d love him because he takes a dark view of America,” Bodwell said. Like his characters, Dubus, who grew up Catholic in Louisiana and spent six years in the Marines, had plenty of his own struggles. His first work, “The Lieutenant,” published in 1967, was a novel, but after he decided to devote himself to writing short stories, it took him seven rejection-filled years to find another publisher. He married and divorced three times, fathering six children. (One is the writer Andre Dubus III, now a friend of Bodwell’s.) Dubus settled in Haverhill, Massachusetts, where in 1986, driving home from Boston one evening, he stopped to help two fellow motorists. A car struck them, killing one of the motorists instantly and crushing Dubus’s legs. Dubus, who’d been a lifelong runner, spent the rest of his life in a wheelchair, struggling with depression, multiple surgeries and mounting medical bills. For years after the accident, he wrote no fiction; a decade later, his final book of stories was published. He died of a heart attack at age 62. Why republish? What does his work have to say to readers today? Family, faith and morality, violence, the complicated relationships between men and women – these are the themes Dubus returns to repeatedly in his stories, many of which are set in working-class Massachusetts towns like Haverhill. In addition to Chekov, Carver and O’Connor, Dubus has been compared to several other literary giants – Richard Ford, William Faulkner and Ernest Hemingway. 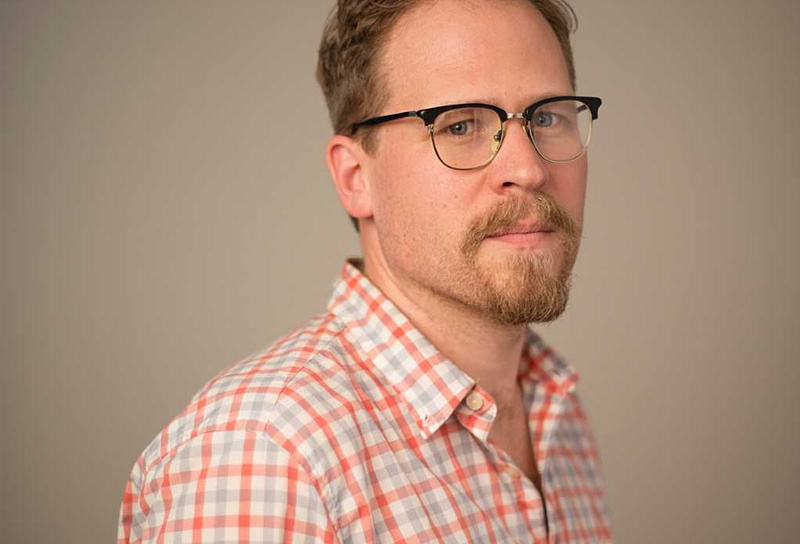 As editor of the series, Bodwell was responsible for picking the titles, overseeing the covers and deciding on the size and look of the books. Maine photographer Greta Rybus shot and helped conceptualize the covers, each of which has a single vivid image. Volume two sports a glass of spilled red wine. The patch of speckled, butter-colored linoleum stained by the wine came from Mardens, Bodwell laughed, and cost $3. Typically, editors work with writers. A book or a story is, to some extent, a collaboration. It goes without saying that when the writer is dead that doesn’t – it cannot – happen.